My photos today came out terrible. -_- I don’t know why but my camera just would not focus properly and I was in a frantic rush because once again I did not make my bento last night like I should have. My aunty commented yesterday that my portions looked huge in some pics and though these bento boxes are actually quite small, she was right about the fried rice portion. I’d had no idea I packed so much in that one box! 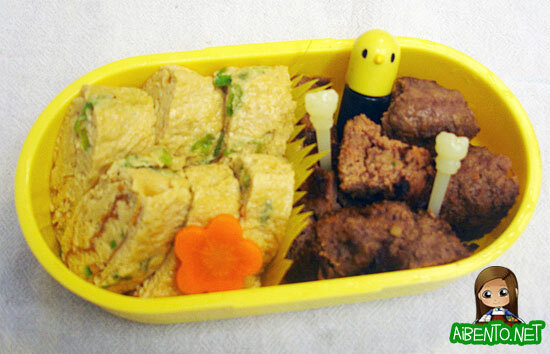 I ended up only eating half of it and took the rest home for today’s bento. 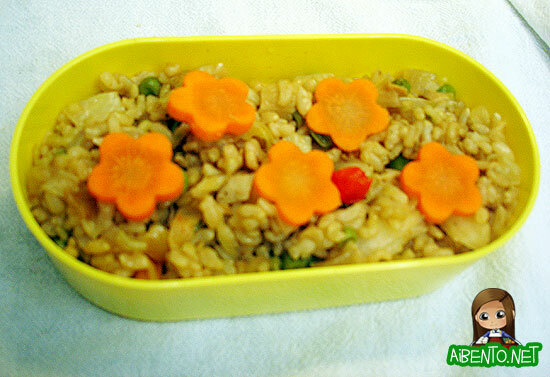 I chose my new banana putifresh box and the veggies in the rice had taken on a rather drab color, so I added some carrot flowers. This was only one patty and so I’m counting it as 1 point due to the mostly core ingredients. The only thing in it of concern is the whole wheat bread and though the amount is really small, I feel kinda weird calling it Core, thus the point. The tamagoyaki had 2 tsp of sugar in it, but since 2 tsp of sugar counts as .5 points and I only packed 1/4 of the egg that I cooked, I’m not going to count any points for it.